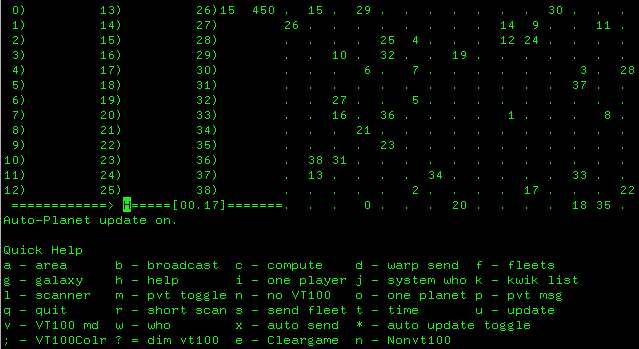 A two player, single terminal Star Trek type game named WAR was written by an unknown author for the CDC-6600/6400 system. See the upcoming link for a bit more information on it. Where it was renamed to "Galactic Conquest". I was sent a copy of this game, and it appears to have similar gameplay to the 1987 version of "Galactic Conquest" that inspired me. It was last maintained by Byron Guernsey. 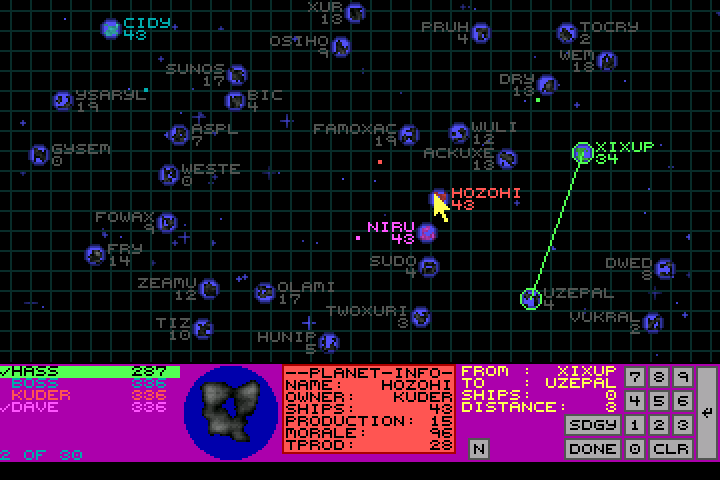 A game named "Stellar Invasion" written by BEARBYTE SOFTWARE inspired the 1987 edition of Galcon. I haven't been able to find any info about this game. So no screenshot on this one. However, it is a predecessor of Galcon, though I don't know if it was inspired by the 1980-1985 versions of "Galactic Conquest" or not. I first played this game in 1991 when I was 12 years old. The game was called "Galactic Conquest" and was written by Rick Raddatz. It was one of the first games I played. Other than some two player NES games, it was the first multi-player game I ever played. It could be played with up to six people, and was quite an enthralling good time with six people sitting around a computer. The "moves" were entered via the keyboard and were hidden from other players. Ships weren't visible during flight. All the same, it was a non-stop thrill ride of 80x25 text-mode goodness. You can still play Galactic Conquest in all of its original glory by using dosbox. I knew I had to re-make "Galactic Conquest" sometime. It's graphics (being text) were rather dated, and I knew I could make something pretty swell. Putting it together was one of my first VGA games (which meant it had 256 colors, instead of just 16.) I used XLib and TurboC and was able to make it a hi-res VGA game "360x240" ooooh. Again the game was multi-player, and it was played by people gathered around a single computer. 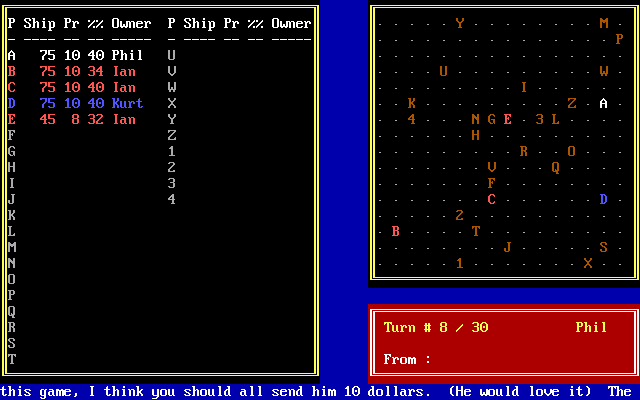 Since the controls were mouse based, the players each took turns in a random order. 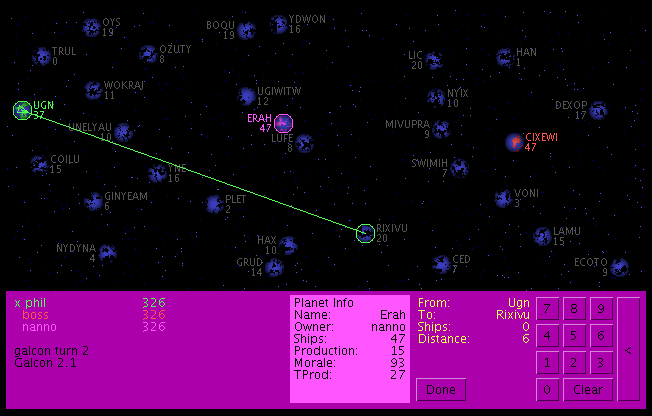 The game included fractal planet surfaces and dots representing ships in flight. One of the classic games of my VGA "Galactic Conquest" was when I had a few friends to my place, one named Dave. 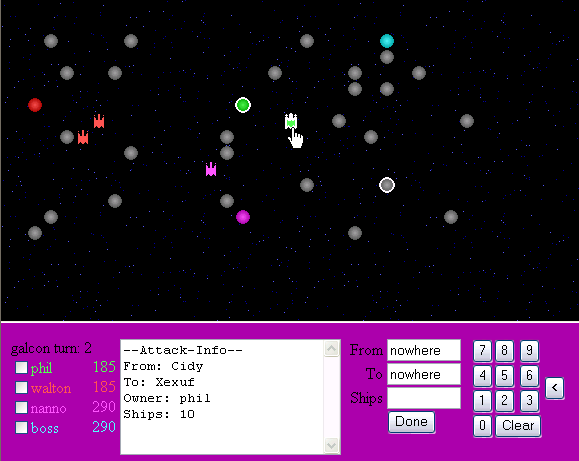 Shortly before Dave arrived, my friend Jason and I tweaked the code so that when his name was entered, the game would automatically make all his ships move at 1/2 speed and his planets have 1/2 production. It took at least 45 minutes of him griping and whining about how he never could win before he figured it out. Sucker. The game was pretty swell in that it included visuals of ships in flight, which you could mouse-over for some statistics about the fleet of ships. Unfortunately, tragedy struck and the server side perl script that I was using to run Galcon had some file locking issues that caused the webserver I was hosting it on to disable the script. This version of Galcon never saw the light of day again. ... until I re-wrote it with PHP / MySQL! This was my first PHP / MySQL project and was quite a bit of fun. I made it to work with my Java Applet as well as added in a retro-web based-text-mode version of the game. I didn't have PHP for my website at the time, so I hosted the game on a friend's computer who had a static IP at college. Again, it wasn't around for very long. Now we get to the present. 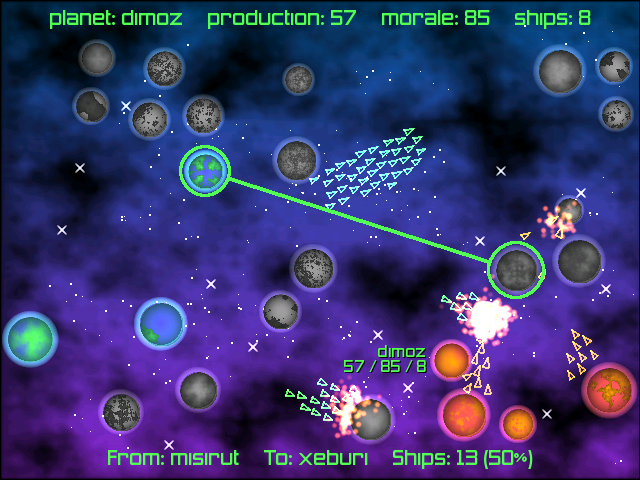 Galcon as we know it was an entry to the Ludum Dare 48 hour game development competition in 2006. This version was single player vs. computer opponents and swept the competition. 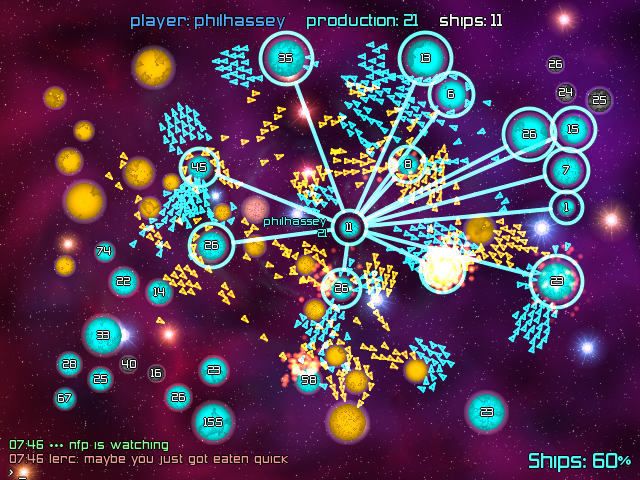 Interestingly enough - the theme was swarms, which gave us that great swarming ship feel that the game has. I was all against the theme (themes are voted for in this compo), having made a game recently that used swarming techniques. But hey, it won. If it hadn't, I doubt we'd have the Galcon we have today. On May 14, 2006, Galcon was announced the winner of the 8th Ludum Dare competition held April 28-30th. Phil swept the competition, with four 1st places and one 2nd place award. You can download the compo release .ZIP or the .TGZ. You can read about the 48 hours of madness in my Ludum Dare post mortem. After the compo so many folks enjoyed it that I went on to make it multi-player, enhance the graphics, and whatever else I've done. It took a good six months after the compo to get the initial release out. Since then I've been enhancing it as I go along. Since then I've made many, many, many versions of Galcon! A lot of them are listed in the "Gone But Not Forgotten" section of my games page. 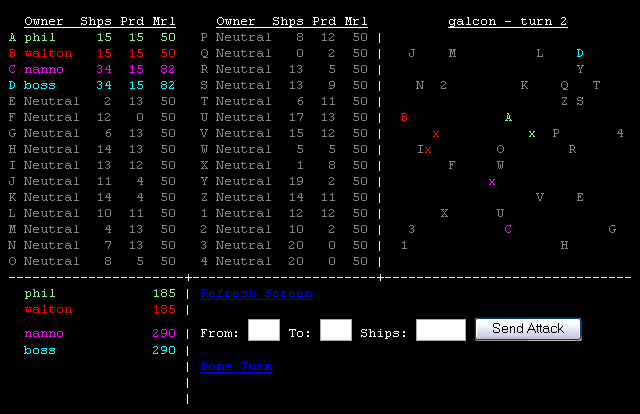 If you want to play the very latest version of Galcon, just go to the Galcon homepage and check it out!